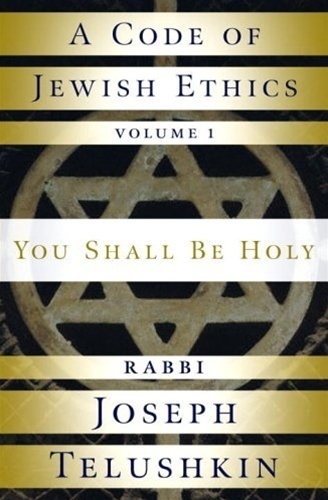 A Code of Jewish Ethics, Volume 1: You Shall Be Holy is the initial volume of the first major code of Jewish ethics to be written in the English language. It is a monumental work on the vital topic of personal character and integrity by one of the premier Jewish scholars and thinkers of our time. 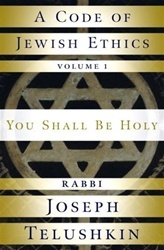 With the stated purpose of restoring ethics to its central role in Judaism, Rabbi Joseph Telushkin offers hundreds of examples from the Torah, the Talmud, rabbinic commentaries, and contemporary stories to illustrate how ethical teachings can affect our daily behavior. The subjects dealt with are ones we all encounter. They include judging other people fairly; knowing when forgiveness is obligatory, optional, or forbidden; balancing humility and self-esteem; avoiding speech that shames others; restraining our impulses of envy, hatred, and revenge; valuing truth but knowing when lying is permitted; understanding why God is the ultimate basis of morality; and appreciating the great benefits of Torah study. Telushkin has arranged the book in the traditional style of Jewish codes, with topical chapters and numbered paragraphs. Statements of law are almost invariably followed by anecdotes illustrating how these principles have been, or can be, practiced in daily life. The book can be read straight through to provide a solid grounding in Jewish values, consulted as a reference when facing ethical dilemmas, or studied in a group. Vast in scope, this volume distills more than three thousand years of Jewish laws and suggestions on how to improve one’s character and become more honest, decent, and just. It is a landmark work of scholarship that is sure to influence the lives of Jews for generations to come, rich with questions to ponder and discuss, but primarily a book to live by.